Created a gorgeous slideshow in Photos? Here's how you can share it with your friends and family. When it comes to showing off your pictures and movies, nothing beats a great slideshow, and the ones you can craft in Photos for Mac are gorgeous. You can also export a saved slideshow project as a movie in order to share it with others. However, the way you share exported slideshow movies depends on the capability of your recipient. Do they have a computer? Do they have an Apple TV? Do they have a DVD or Blu-ray video player? Will you be there in person with an iOS device? In this column, you’ll learn strategies for each of these situations. Once you finish crafting a saved slideshow—made by choosing File > Create Slideshow or by clicking the + icon and choosing Slideshow—you can export it in .m4v format in a variety of sizes. If you’re in Projects view and the slideshow is open, click Export at the upper right of Photos’ toolbar to get the party started. 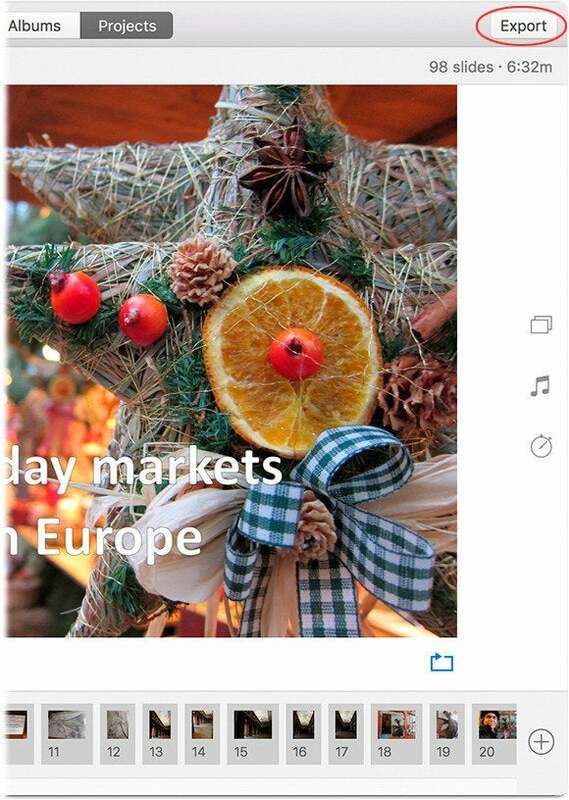 An Export button appears at upper right whenever a saved slideshow project is open. Standard Definition (480p). 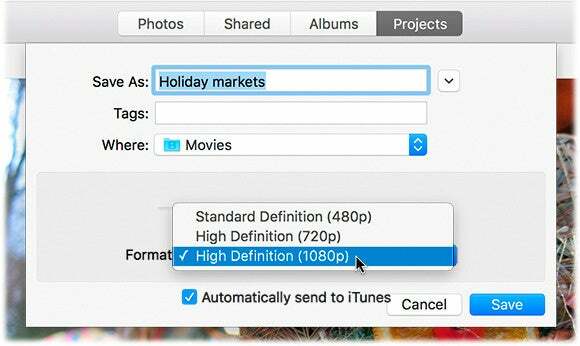 This option produces a 640 x 480 pixel movie, which is great for transferring onto an older iOS devices (iPod touch 3rd generation, iPhone 3GS, iPad 1, and 1st generation Apple TVs). It produces the smallest file size, so it’s a good choice if you plan to share the slideshow with someone who doesn’t have high-speed Internet access (gasp!). High Definition (720p). This option produces a 1280 x 720 pixel movie, which makes for a larger file size but it looks fantastic onscreen. It’s perfect for newer but not the newest iOS gadgets such as a 4th generation iPod touch, iPhone 4, iPad, 2nd generation Apple TVs, for posting onto Facebook or YouTube, or for sharing via file-transfer service like iCloud Drive or Dropbox (there’s more on those services in a bit). High Definition (1080p). Choose this option for a stunning 1920 x 1080 pixel movie, which is what you want for viewing on the latest iOS devices, Apple TVs, and TV screens. The file size will be humongous, but the movie will look awesome. If you have an iOS device, turn on “Automatically Send to iTunes” so you can sync the movie onto your gadget, as described later. As mentioned earlier, how you share the exported movie depends on your recipient’s equipment and whether or not you’ll be there in person. Below are some common scenarios and how to handle them. Method 2: Copy the exported movie to a USB flash drive, CD, or DVD and then physically mail it to them (preferably with instructions for playing it). For example, your recipient must insert the disc or attach the flash drive to their computer and double-click the movie file to play it. To copy your slideshow to a USB flash drive, drag the movie file onto the drive. To burn the movie to a CD or DVD, you need an optical drive, which newer Macs lack. When you burn an exported movie onto a CD or DVD, you create a data disc (not a video disc), which is like sharing files on a USB flash drive. To copy the movie onto a blank CD or DVD, insert the disc into your Mac’s optical drive, or an external one, and then drag the file onto the disc icon on the desktop. When you eject the disc, your Mac offers to burn the files onto the disc. Copying your movie file to a USB flash drive is a drag-and-drop affair. Method 3: If your Mac’s running OS X Yosemite or later and you’re signed into your iCloud account, you can use the Apple Mail app to email the movie using OS X’s Mail Drop feature. To do that, attach the exported movie to an email and then click Send. 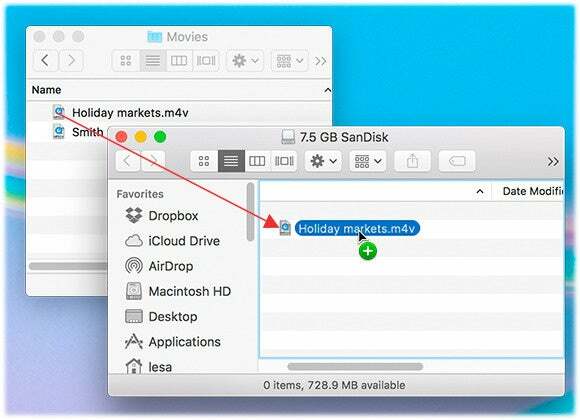 If your recipient is also running OS X Yosemite or later and using Apple Mail, the movie file appears as an attachment to the email message. If they’re running an earlier version of OS X, Windows, or using a different email app, they’ll see a link to download the movie. Happily, Mail Drop file transfers don’t count against your total iCloud storage allotment. However, if your recipient’s email provider doesn’t allow them to receive large attachments, your message may be returned as undeliverable. Use the instructions in method 2 in the previous section to burn the movie onto a CD or DVD and then physically mail it to your recipient with instructions on how to play it. It’s worth noting that the movie(s) on the disc won’t play automatically when your recipient inserts the disc; to play the movie using a DVD or Blu-ray player, use the arrow keys on the player’s remote to navigate to the file and then click the remote’s play button to fire it up. Not all DVD and Blu-ray players can play an .M4V file. To maximize the likelihood of it playing, change its filename extension from “.m4v” to “.mp4” before burning it to disc. If you can be there in person and you have a newer MacBook or iOS device, you can use AirPlay to broadcast the movie onto your recipient’s AppleTV-connected TV screen. To learn how, see Dan Frakes’ video, Get started with AirPlay. To sync the movie on your iOS device, keep reading. Method 1: Use iCloud Drive. iCloud Drive is the name for the online storage space you get with an iCloud account. When you upload files to iCloud Drive, you can download them onto another computer—Mac or a PC running Windows 7 or later—or any iOS device that’s signed into your iCloud account. Files can be up to 15GB in size, but you can’t exceed your overall iCloud storage limit. To do it, go to the Finder on your Mac and choose Go > iCloud Drive to open an iCloud Drive window, and then drag the movie into the window. Alternatively, you can expand Photos’ Export pane and choose iCloud Drive from the Favorites list that appears at left. Annoyingly, downloading files from iCloud Drive onto an iOS device requires some effort. First, enable the iCloud Drive app inside the iCloud settings on an iOS device running iOS 9 or higher. Second, you have to play the movie in the iCloud Drive app while you have an Internet connection in order to download it. So launch the iCloud Drive app on your iOS device and in the resulting window, tap the movie file to play it. For more on using iCloud Drive, see Leah Yamshon’s story, Hands-on with iCloud Drive, a brand-new app in iOS 9. Method 2: Sync via iTunes. If you turned on “Automatically Send to iTunes” feature in Photos’ Export pane, your movie already lives in iTunes in the Home Videos section of the Movies category. If you didn’t, you can always drag the file onto the iTunes window to import it. Attach your iOS device to your Mac and pick it from the device list near upper left. In the Settings section on the left, choose Movies and then turn on Sync Movies. Turn on the checkbox of the movie you want to sync and then click the Apply button at lower right to trigger a sync. The synced video ends up in the Videos app on your iOS device in the Home Videos section. 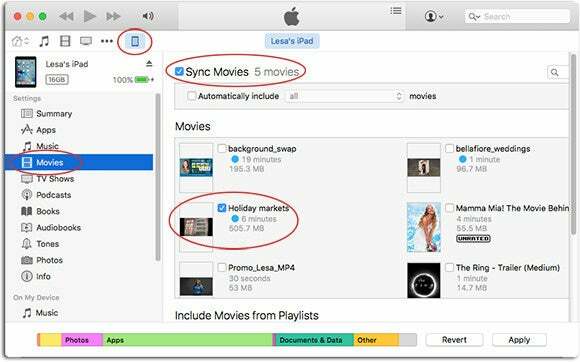 In order to sync an exported movie onto your iOS device(s), you must first turn on Sync Movies. As you can see, sharing exported slideshow movies takes some doing, but it’s well worth the effort. Until next time, may the creative force be with you all!